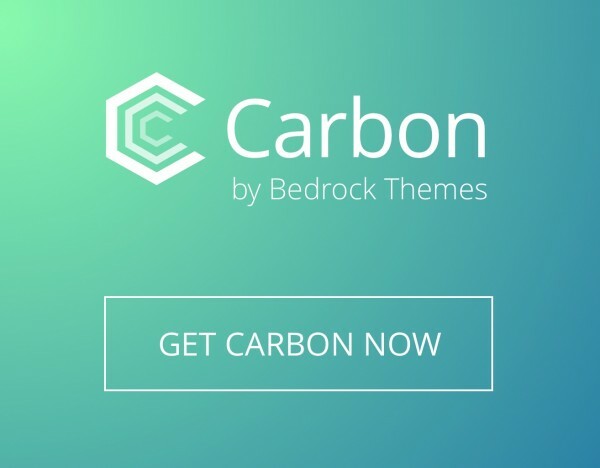 We are proud to announce the release of our first theme – Carbon! Get Carbon NowCarbon is a fully responsive simple WordPress theme; easy to customize and highly adaptable with a responsive mobile-first design. Just install Carbon, and pick a color/font scheme to get going in a few minutes. If you want more control, it’s there right in the WordPress Theme Customizer. Carbon looks great on a mobile phone and looks great on a desktop screen. More than just changing the layout, Carbon is tuned for fast loading on mobile devices. It automatically uses lower resolution images for featured images, etc and minimises requests back to the server so your content is loaded fast, improving the experience of your visitors. To make Carbon even more flexible we have included 9 widgets and 15 different widget areas. From a Google Maps Widget to the Box Menu Widget, you can easily create a stylish, unique design by dragging and dropping. Carbon includes support for Jetpack testimonials and the site logo feature so you can add your own site logo. We know a standardised approach to site logos is coming in WordPress core and will implement that in Carbon as soon as it’s available in core. From the outset our goal with Carbon was to produce a simple WordPress theme that would be easy to use by a WordPress newbie, but also to include enough options for customization so more advanced users can tailor it to their needs. By including 10 one-click “schemes” which include colors and font selections someone new to WordPress can get a basic site up in under five minutes! All of the carbon settings can be changed using the WordPress Theme Customizer. Change colors, fonts and other settings in a familiar environment and preview the changes before going live. Carbon is good for SEO right out of the box, but we have tested with Yoast SEO, Gravity Forms and a range of other plugins to ensure the most popular plugins work. Going forward we are committed to retaining compatibility with all popular plugins.